Whether it comes from financial pundits, hedge-fund managers, your next-door neighbor or even the president of the United States, stock market chatter often is short-term in nature. What did the Dow gain today? 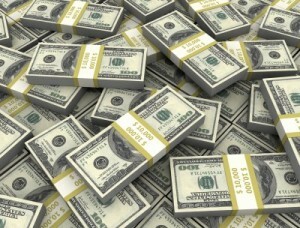 How has your 401(k) done recently? Hey, buddy … you got a hot stock tip for me? Well, I’m not a day trader, and I’m not wired that way. 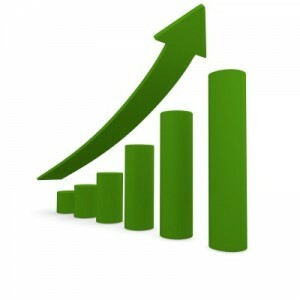 That’s why I mostly use Dividend Growth Investing — a long-term approach whose benefits come from owning high-quality, income-growing companies for years and years. As a dominant name in high-speed Internet and entertainment content, Comcast (CMCSA) is a nice fit for that kind of long-range strategy. Although its sub-2.5% dividend yield might be unimpressive to some income-oriented investors, the company’s annual payout has increased significantly for more than a decade … and there is every reason to believe aggressive growth will continue for years to come. 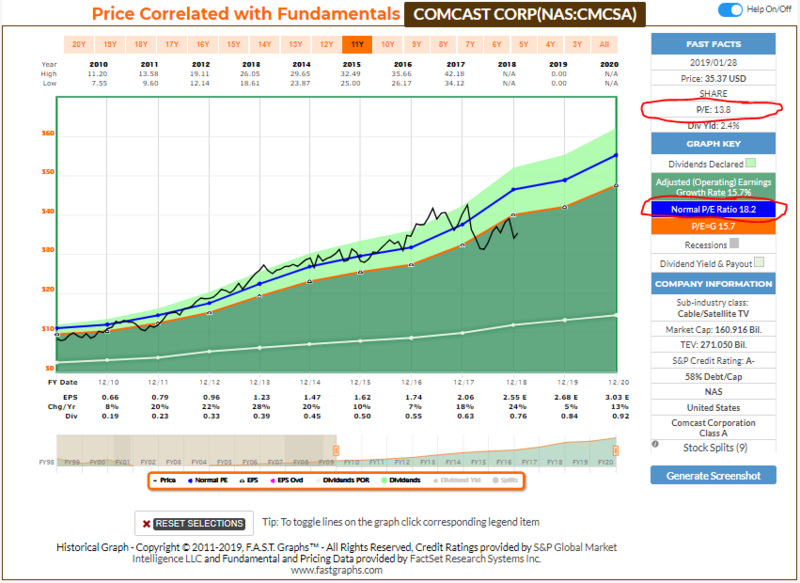 Comcast certainly is a worthy choice for DTA’s Income Builder Portfolio, and on Tuesday, Jan. 29, I executed a purchase order for 28 shares at $35.72 each on Daily Trade Alert’s behalf. Total paid was $1,005.11, including the $4.95 commission — which, as indicated by the red-circled areas, was divided on a pro-rated basis. In my previous article, I explained many of the reasons I selected CMCSA for the IBP. 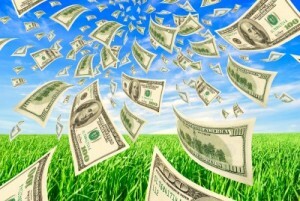 The reliable, growing dividend ranks high on the list. 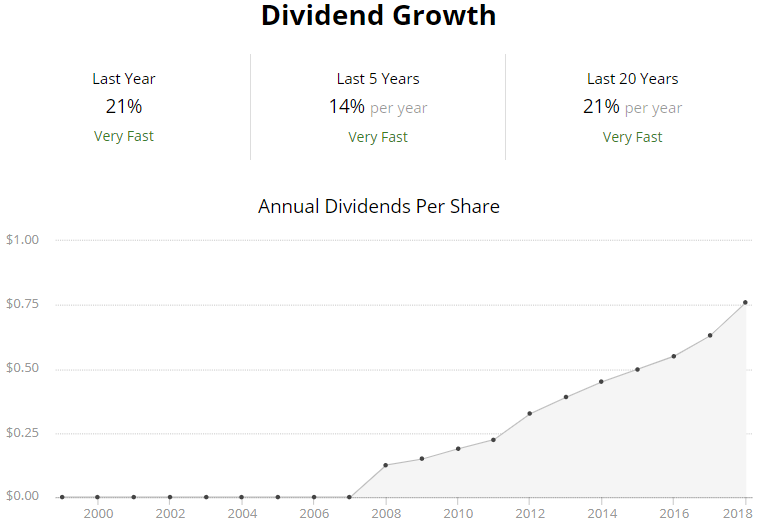 The above graphic from Simply Safe Dividends is impressive enough … and it doesn’t even include the company’s recently announced 10% hike of the quarterly dividend to 21 cents per share. Come April 24, the IBP’s 28-share stake in CMCSA will generate a $5.88 payment. Because the portfolio’s Business Plan stipulates that all dividends get automatically reinvested, the spring divvy will buy about .165 of a share (if the price is similar to what we just paid for our position). Then, in July, the new share total of 28.165 will result in another $5.91 for the IBP — which then will be used to by another fraction of a share. The process will be repeated every three months, not only for CMCSA but for all IBP positions, so one can see why we named this endeavor what we did. Building this kind of portfolio is practical only if each component’s dividend is relatively safe. 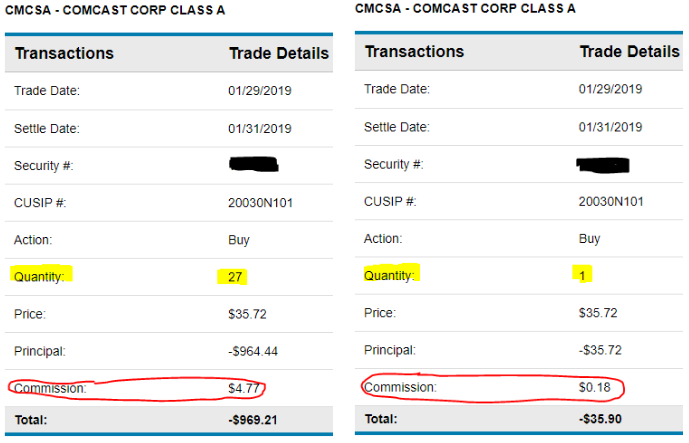 The following graph from McLean Capital Research indicates that Comcast generates significantly more free cash flow than it needs to make its quarterly payments. Citing the company’s low payout ratio and its consistently good earnings growth, Simply Safe Dividends gives CMCSA a safety score of 86, meaning it is highly unlikely to cut its payout. Generally, those who follow the company closely are bullish on Comcast, as illustrated by the following Thomson Reuters survey of 33 analysts. Schwab gives Comcast a “B” rating — saying their analysts believe the stock will outperform the market. CFRA’s analyst considers CMCSA to be one of the strongest buys out there, with a 12-month target price of $44. 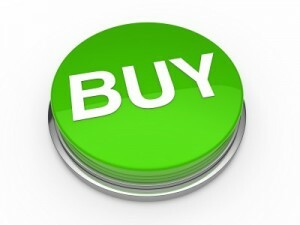 Argus is yet another analytical firm with a “Buy” rating on Comcast, and has established a target price of $48. With a forward P/E ratio of about 13, and a low PEG ratio of 1.0, Comcast sure does look favorably valued. 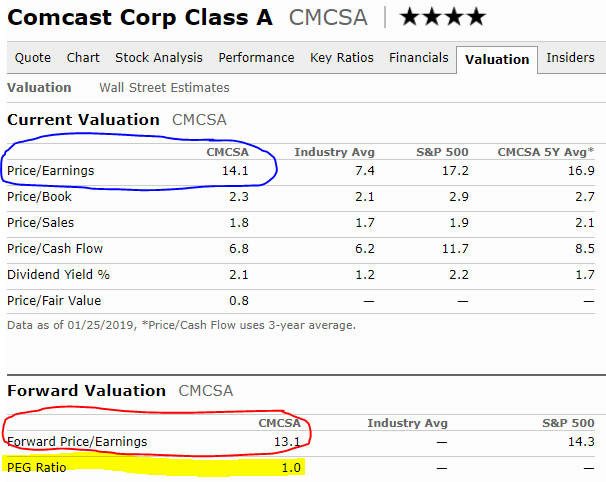 In addition to the above information, Morningstar — which includes CMCSA in its 31-stock “Dividend Select Portfolio” — just raised its fair value estimate to $45, as shown below. Value Line put Comcast on its list of 100 “Highest Growth Stocks” because the company’s annual growth of sales, cash flow, earnings, dividends and book value have averaged 10% over the past 10 years and are expected to average at least 10% in the coming 3-5 years. Below, see that Value Line gives CMCSA a “relative P/E ratio” of 0.91 (1.00 means fairly valued compared to the 1,700 stocks VL covers), and a target price range suggesting 70% to 130% price appreciation over the next few years. 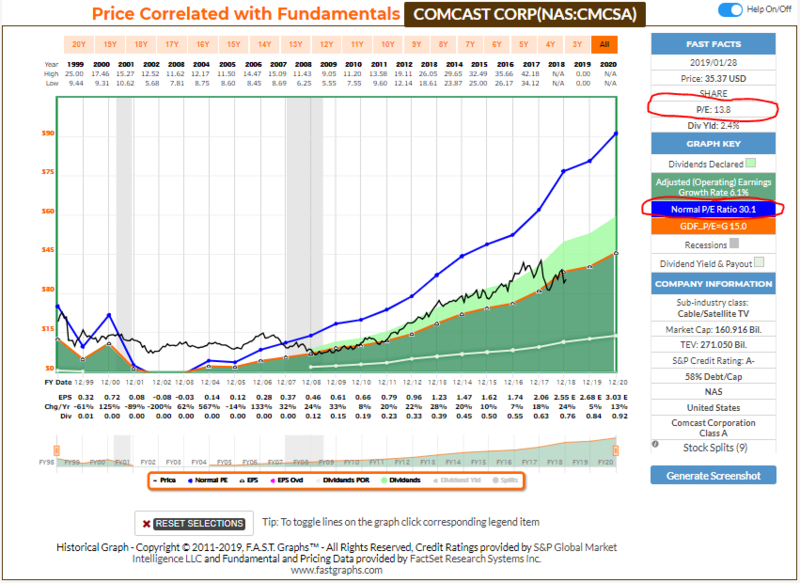 Simply Safe Dividends says all of the following metrics show that Comcast is a good value. 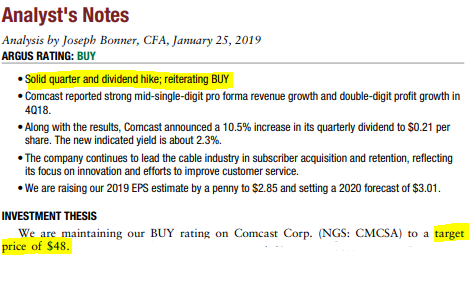 The 52-week price range means little to me, but I do like the other numbers — especially the fact that the 2.35% yield is considerably higher than Comcast’s 5-year average of 1.70%. FAST Graphs also indicates that CMCSA is undervalued, and that’s the case whether one uses a 20-year or a 10-year timeline for the company’s historic valuation. Quality is always the main thing I look for in companies for the Income Builder Portfolio, and I believe Comcast — with its A- credit rating from Standard & Poor’s, its 2 Safety score from Value Line and its dominant, wide-moat position within its industry — qualifies. If quality is #1, value is #1A. I mean, who doesn’t love a sale? By pretty much any measure, CMCSA is attractively priced. So Comcast is a welcome addition to the IBP — our long-term, real-money, no-trader-mentality portfolio — and I look forward to years of outstanding income growth and solid total return. As always, investors are urged to conduct their own due diligence before buying this or any other stock.